The Chicago Glass Mfg. Co. was established in Cicero, Illinois in 1926. By sometime in 1927, this company was operating as the Vidrio Products Corp. In 1936, the company was bought by Becker Brothers Carbon Company. Vidrio merged with Grand Sheet Metal Company in 1946, and ceased operations in 1953. In the early years, it is generally thought that Vidrio produced most, if not all of their own glass. However, after they were bought by Becker brothers, production of glass appears to have diminished and much glass was purchased from sources such as the Houze Glass Company of Point Marion, PA, and other American glass companies. 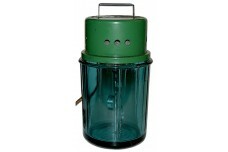 Major products included colored glass specialty items such as ashtrays, cigarette and cigar lighter enclosures, gear shift balls, and lamp and smoking stand parts. The bases and spindles of the lamps and smoking parts were interchangeable and could be combined with metal parts in many different configurations to form the finished products. Although Vidrio items may be found in transparent colors, the primary focus of the company was the production of opaque colored items. Colors most commonly found range in hue from beige to yellow and are usually marbleized with veins of browns or maroons. 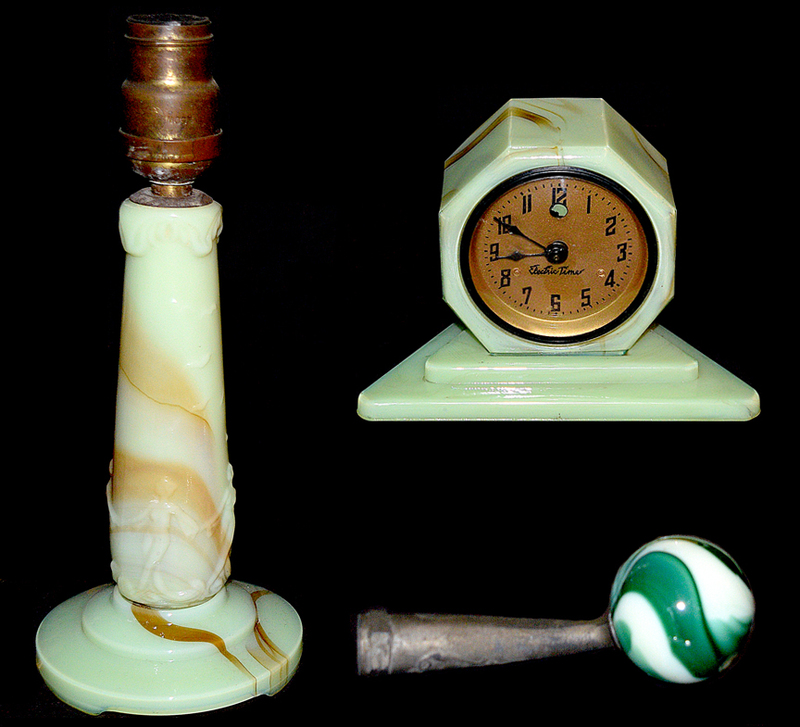 Solid opaque colors such as jade green and black and marbleized blues and greens are seen less frequently. Some products may be identified by the embossed "Vidrio Products Corp." logo while others may still have an identifying paper label still attached. 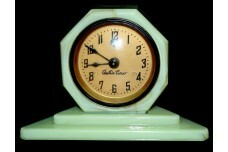 Vidrio Slag Glass Cadillac Electric DECO Time Clock - Super Nice Condition!